An M15 Select Bus Service bus operates through the Lower East Side, bound for South Ferry. Bx6: Washington Hts. – Hunts Pt. M60: Upper West Side – LGA Airpt. Select Bus Service (SBS; stylized on the buses as +selectbusservice) is a brand used by the Metropolitan Transportation Authority (MTA)'s Regional Bus Operations for bus rapid transit service in New York City. SBS began service in 2008 in order to improve speed and reliability on long, busy corridors. SBS routes use vehicle-segregated, camera-enforced bus lanes; sidewalk extensions for bus stops; relatively long distances between stops; vehicular turn restrictions along corridors; and next-bus travel information screens. The first route was the Bx12 along Fordham Road and the Pelham Parkway; as of January 2019[update], eighteen SBS routes run along seventeen corridors. Twenty-one more routes are proposed through 2027. However, in summer 2018, the MTA announced that it was considering delaying the implementation of SBS routes outside Manhattan until 2021 because of the city's upcoming bus-network redesign. In 2002, Schaller Consulting conducted a study on potential bus rapid transit services in New York City. In 2004, the MTA in conjunction with the New York City Department of Transportation and New York State Department of Transportation, performed an initial study on bus rapid transit, with 80 corridors studied citywide. In late 2004, the MTA identified five corridors for implementation of bus rapid transit, one in each of the five boroughs: the Fordham Road/Pelham Parkway corridor in the Bronx, First Avenue and Second Avenue in Manhattan, Merrick Boulevard in Queens, Nostrand Avenue in Brooklyn, and Hylan Boulevard in Staten Island. Four bus priority corridors were also identified for implementation or expansion (three in Manhattan, one in the Bronx): Madison Avenue (expansion), Fifth Avenue, 34th Street, and Webster Avenue. The Merrick Boulevard corridor was eventually scrapped because of community opposition related to loss of parking. However, the corridor is being considered again as part of the Bus Forward study in 2017. The Select Bus Service program was unveiled to the public on March 25, 2008. At the time of the announcement, the MTA and then-Mayor Michael Bloomberg had stated that implementation on other corridors was contingent on the passage of congestion pricing, which ultimately did not make it for a vote in the legislature. The first Select Bus Service corridor, on the Bx12 along 207th Street, Fordham Road, and Pelham Parkway, was placed into service on June 29, 2008. The next line, the M15, saw Select Service begin on October 10, 2010 after the delivery of new low-floor buses. The M34/M34A line was started on November 13, 2011. Initially, a 34th Street busway was planned that would require eliminating 34th Street as a through street, but it was dropped in favor of the standard SBS model. The B44 Rogers/Bedford/Nostrand Avenues bus route, the fifth Select Bus Service corridor in the city, was implemented on November 17, 2013 after the arrival of new fare machines. The S79 Hylan Boulevard/Richmond Avenue route, initially slated to be converted to SBS in 2013, was moved up to September 2, 2012; the local equivalents of the S79 route are the S78 and S59 buses. A sixth corridor, the second for the Bronx, began service on the Bx41 Webster Avenue route on June 30, 2013; this route was the first "Phase II" SBS route to begin service (the existing corridors plus the B44 comprise Phase I). Another Select Bus Service route on Webster Avenue, which will be extended to run between LaGuardia Airport and Fordham Plaza alongside the local Bx41 route, is proposed for later implementation. A seventh corridor, and the third for Manhattan, the M60 125th Street–Triborough Bridge–Astoria Boulevard bus route to LaGuardia Airport, was converted to SBS on May 25, 2014; local service was replaced by other routes running alongside the route of the M60 (the M100, M101, Bx15, and Q19). An eighth Select Bus Service route was planned in the 2014–2017 Financial Plan. The eighth Select Bus Service corridor (ninth route overall), and the fourth in Manhattan, was for the M86 running on 86th Street, which was originally scheduled to start running on June 28, 2015, but pushed back to July 13, 2015; it did not include a major change in stops. The ninth corridor, and the second for Brooklyn, is the B46 on Utica Avenue. When implemented, the local and Select Bus Service route of the B46 changed northern terminals to improve reliability. Originally planned for implementation in fall 2015, it was instituted on July 3, 2016. The tenth corridor, and the first for Queens, is the Q44 limited bus route running on East 177th Street (the Cross Bronx Expressway service road) and Main Street, which began on November 29, 2015. Selected stops in the Bronx were combined into much busier stops for faster service, and some stops in Queens have been replaced by the Q20A/B local routes. As both the Q20 branches do not enter the Bronx and the Q44 ran local late nights only, the Q44 gained 24/7 SBS service between the Bronx Zoo and Jamaica. The Q20A replaced the Q44 local in Queens late nights. On September 25, 2016, the eleventh corridor (twelfth route overall) and the second for Queens, the Q70, was rebranded as the "LaGuardia Link" and became a SBS route. As opposed to other SBS routes, the Q70 is wrapped in a light blue scheme with clouds and airplanes in order to encourage more people to use public transportation when using the airport. This marked MTA Bus's first SBS route, as well as the second for Queens and the eleventh overall. The M23, the twelfth corridor (thirteenth route) and the fifth in Manhattan, became a Select Bus Service route on November 6, 2016 with dedicated bus lanes and countdown clocks at some stops, replacing M23 local service at the cost of $1.7 million. The M79 became an SBS route on May 21, 2017, with the installation of bus lanes along its route. The Bx6, after the completion of bus lanes and widened sidewalks, became an SBS route on September 3, 2017. It supplements the local service by stopping at high ridership stops. This is the third route for the Bronx. Select Bus Service along Woodhaven and Cross Bay Boulevards was implemented on the Q52 and Q53 routes on November 12, 2017. Select Bus Service along Kings Highway was implemented on the B82, which replaced the former Limited-Stop route, on October 1, 2018. The city subsequently announced that following the implementation of the B82 SBS, it would halt the implementation of Select Bus Service in the outer boroughs until 2021 as a result of budget cuts, and an upcoming redesign of the city's bus network. A temporary M14 Select Bus Service route was proposed for implementation in early 2019, in preparation for the 14th Street Tunnel shutdown. This route would have run between Tenth Avenue and Stuyvesant Cove Ferry, with local service on the M14A and M14D. Five additional temporary routes would have been implemented for the shutdown in April 2019. However on January 3, 2019, the shutdown plan was altered by Governor Andrew Cuomo and the proposed SBS routes were put on hold. In February 2019, the MTA announced plans to implement SBS on the M14A and M14D. On March 6, 2019, the NYCDOT met with elected officials and revealed plans to implement Select Bus Service on both the M14A and the M14D in June 2019, with an accelerated time line to provide an alternative to L service. The implementation of bus lanes on the branches in the Lower East Side will be implemented later on. Bus stops on the A and D branches will be spaced out to speed up service. The M14A's terminal loop through Abingdon Square will be eliminated and service will be extended to Tenth Avenue. Bus lanes will either make use of the busway layout intended for the Tunnel shutdown or will consist of standard bus lanes. All current SBS corridors are enforced by cameras restricting non-buses in these lanes on weekdays where the bus lane is curbside, with the bus lanes marked by red paint. Where the bus lane is an offset lane (that is, one lane away from the curb), non-bus traffic is restricted at all times except for emergencies. Currently, SBS operates eighteen different bus lines on sixteen different corridors. By order of implementation, SBS was placed on the Bx12, M15, M34, M34A, S79, Bx41, B44, M60, M86, Q44, B46, Q70, M23, M79, Bx6, Q52, Q53, and B82 routes. SBS replaced nearly-identical limited-stop service on the Bx12, M15, Bx41, B44, Q44, B46, Q70, Q52, Q53, and B82 where corresponding local bus service still operates (except on the Q44, whose nighttime local variant was eliminated and replaced with the full-time SBS route, and the Q70, which had no local equivalent before the conversion,). The Bx6 SBS was split from the Bx6 local, which had no limited-stop variant prior to SBS implementation on that route. The B82 SBS did not replace service along the original B82 LTD portion between Bay 37th St and Coney Island. For the other routes, all service was converted from local to SBS, and numerous local stops were combined or omitted. The Bx12, M15, M34, M34A, S79, Bx41, B44, B46, Bx6, and Q52 routes run the whole day, while the M60, M86, Q44, Q70, M23, M79, and Q53 routes run at all times. The B82 is the first and only SBS line to not run on late nights and weekends. The Bx12 Limited was the first route to be converted into a Select Bus Service line, the Bx12 SBS. It was placed into service on June 29, 2008 replacing limited stop service with SBS on this line. Both Bx12 Select Bus Service and Bx12 local are based out of the Gun Hill Bus Depot. During late nights, the corridor is served by the Bx12 local service, which operates 24/7. A geographically correct map of the Bx12 Select Bus Service route, showing all stations and connections. The route is in light blue. ^ Sedgwick Avenue stop added in January 2009. ^ Bartow Mall stop added in Spring 2009. A geographically correct map of the M15 Select Bus Service, showing all stations and connections. The route is shown in turquoise. The M15 Limited became the M15 SBS on October 10, 2010, which replaced limited stop service with SBS on this line. Southbound transfers from the M15 SBS require walking south to the corresponding streets and vice versa. Originally based out of the 126th Street Bus Depot, since January 2015, M15 Select Bus Service is based out of the Mother Clara Hale Bus Depot, while the M15 local is based out of the Tuskegee Airmen Bus Depot. The M34 SBS and M34A SBS routes began on November 13, 2011. These are considered by the MTA as two SBS services, the M34 34th Street Crosstown and the former M16 route, which was renamed the M34A; the routes share a single corridor. Originally, a provision of this corridor was planned to create a special "Busway" which would have seen both the M34 and M34A SBS lines run along 34th Street in a special two-lane corridor with vehicular traffic travelling in only one direction (westbound after 6th Avenue/Broadway; eastbound after 5th Avenue), this was eventually scrapped and replaced with curbside and offset bus lanes along 34th Street with bus bulbs at selected bus stops. The stops are listed below from west to east. Alternate M34 SBS trips began originating/terminating at Waterside Plaza with the M34A SBS on September 3, 2017. This service used non-articulated Orion 7 hybrid-electric buses between November 2011 and early April 2013, when they were replaced by the articulated buses found on the majority of the other SBS routes. The M34 and M34A are both based in the Michael J. Quill Bus Depot. An S79 SBS bus at the Staten Island Mall. The S79 SBS route began on September 2, 2012. While the routing was left mostly intact, the S79 had all local service eliminated and replaced by local service on the S59 route along Richmond Avenue and the S78 route along Hylan Boulevard. The route was also straightened through New Springville to bypass the Yukon Bus Depot. This route uses rigid 40-foot Orion VII hybrid-electric diesel buses, and is the only SBS line that does not utilize off-board fare collection. Additionally, it was the only SBS line in the 5 boroughs that did not use 60-foot articulated buses before the B46 SBS was introduced as well as the only SBS line to not have blue destination signs until July 2017. Riders must pay the fare on board, as they do on local, limited-stop, and express buses. The S79 Select Bus Service is based out of the Yukon Bus Depot. Northbound is towards Brooklyn and southbound is towards Staten Island. The Bx41 Limited, running along Webster Avenue and Melrose Avenue in the Bronx, was the first route to be converted into a Phase II Select Bus Service line. The Bx41 SBS began service on June 30, 2013. The stops are nearly identical to the limited service it replaced, and service was expanded from peak hours to seven days a week. The stops are listed from south to north below. Both Bx41 Select Bus Service and Bx41 were originally based out of the Kingsbridge Bus Depot. However, on January 8, 2017, the line was moved to Gun Hill Depot from Kingsbridge with the Bx12 local and SBS, to ease the pressure, and relieve the severe overcrowding at the Kingsbridge Bus Depot. A map showing the B44 SBS (in light blue) with rail connections. The B44 SBS route began on November 17, 2013, replacing the B44 Limited service with Select Bus Service. Initially planned for the end of 2011, then later the summer of 2012, the start date was pushed to November 2013 as the buses for the service did not arrive until early 2013. Unlike other SBS routes, this service involved a significant change in route, and approximately 20 limited stops were eliminated. The elimination of the Avenue L stop, located adjacent to a school, from the SBS route, was controversial, with local elected representatives and community members starting a petition and calling for its restoration. On February 11, 2014, just under three months since its launch, the MTA conceded to community pressure and added Avenue L and Gates Avenue to the SBS route. This bus is based out of the Flatbush Bus Depot. Stops are listed from south to north. ^ Newkirk Avenue and Avenue D stops added to the plan in 2010. ^ Hewes Street stop added in September 2011. An M60 bus in Harlem during the debut of SBS service in 2014. The M60 operates between the Upper West Side of Manhattan and LaGuardia Airport, providing crosstown service along 125th Street in Harlem. Select Bus Service was originally scheduled to begin in mid or late 2013, but was pushed to May 25, 2014 due to community opposition, citing loss of available parking spaces along 125th Street in Manhattan. Due to its status as an airport connector, buses on the route are equipped with luggage racks. The M60 was based out of 126th Street Depot upon implementation as a Select Bus Service route. In January 2015, the M60 moved to the Michael J. Quill Bus Depot (where most Manhattan crosstown routes are based out of) due to the closing of the 126th Street Depot. The stops are listed below, west to east; stops at the eastern end of the route, within LaGuardia Airport, are marked "Airport Stop". The route loops around LaGuardia Airport terminal bus stops and continue operate towards westbound terminus. There is no eastbound terminus stand. Passengers traveling eastbound toward LaGuardia Airport must be off the bus by the Terminal A (Marine Air Terminal) stop, or purchase a westbound fare at fare payment machines at LaGuardia Airport stops. Bus stops marked with an (§) are not served between midnight and 6 AM, when the 82nd Street exit (and the airport in general) is closed. An M86 SBS during the debut of SBS service in 2015. The M86 bus, running crosstown along 86th Street in Manhattan, was identified as a potential bus rapid transit corridor in 2009. The M86 SBS route debuted on July 13, 2015. It was the fourth corridor in Manhattan and the fifth Manhattan bus line to have Select Bus Service. The M86 SBS was based out of the Tuskegee Airmen Depot, but was switched to the Michael J. Quill Depot on January 7, 2018. A geographically correct map of the M86 Select Bus Service route, showing all stations and connections. The route is in light blue, bolded. Bidirectional Note: This stop has no fare machines, thus riders boarding here must obtain proof of fare payment receipt at the next stop (Central Park West or Fifth Ave depending on direction of travel). A Jamaica bound Q44 SBS in Flushing, Queens. In 2015, the Main Street corridor, along with the parallel Kissena/Parsons Boulevards corridor and the 164th Street corridor, was studied by the NYC Department of Transportation for the implementation of SBS between Flushing and Jamaica, Queens. The Q44 Limited route, which formerly made limited stops only during the day, was planned for conversion into a full-time bus rapid transit line, with local service continuing to be provided by the parallel Q20A/B services. The Q44 SBS was approved in June 2015, with no changes from the original routing, which runs between Queens and the Bronx. Due to community opposition, bus lanes were only installed on a small portion of the route between Roosevelt Avenue and the Long Island Expressway in Downtown Flushing and Queensboro Hill, and on Archer Avenue and Sutphin Boulevard in Jamaica; portions of the Archer Avenue lanes were installed before the implementation of SBS. The route began service on November 29, 2015. The Q44 is the first Q-prefixed route to have Select Bus Service, which replaces both the Q44 late-night local and daytime limited-stop buses; local bus service in Queens is provided by the Q20A/B, while there is no local equivalent in the Bronx. The Q20A/B and the Q44 SBS are based out of the Casey Stengel Depot. Note: This northbound Bronx bus stop is for drop-offs only. Note: The northbound stop at 38th Avenue is for pick-ups only, while the northbound stop at 39th Avenue is for drop-offs only. Note: Bronx-bound buses stop at Main Street and Manton Street; Jamaica-bound buses stop at Queens Boulevard and 84th Drive near Main Street. The B46 line is the busiest bus route in Brooklyn and 3rd busiest in the entire city. Select Bus Service began July 3, 2016, after being originally scheduled for a fall 2015 implementation. The B46 SBS replaced the B46 Limited, making similar stops along Utica Avenue and Malcolm X Boulevard. Unlike the former Limited, the B46 SBS makes limited stops south of Avenue H, and only runs between Kings Plaza and DeKalb Avenue. The B46 local was extended along Broadway to replace limited-stop service to the Williamsburg Bridge Plaza Bus Terminal at all times. Both the B46 local and Select Bus Service are based out of the Flatbush Bus Depot, as is the B44 SBS. The B46 is the second Select Bus Service in Brooklyn, and the first one to not operate during late nights since the B44 in November 2013. Southbound NYC Bus: B25, B46 local. In Queens, the Q70 limited-stop bus between Woodside and LaGuardia Airport via the Roosevelt Avenue/74th Street station was implemented in September 2013, replacing the portion of the Q33 local bus that went to LaGuardia Airport. Although the Q70 was intended as a bus rapid transit project, it had yet to be branded as Select Bus Service and did not employ most SBS elements, as it lacked ticket machines, all-door boarding, branded buses, and dedicated bus lanes. The Q70 SBS was implemented on September 25, 2016, when it was rebranded as the "LaGuardia Link" with the implementation of off-board payment of fares. As opposed to other SBS routes, the Q70 is wrapped in a light blue scheme with clouds and airplanes on the top half of the bus imposed with the standard SBS livery on the lower half. The Q70, based out of LaGuardia Depot, is the second Queens bus line to have Select Bus Service and the first one for MTA Bus. The route loops around LaGuardia Airport terminal bus stops and continue operate towards southbound terminus. There is no northbound terminus stand. Passengers traveling northbound toward LaGuardia Airport must be off the bus by the Terminal C stop, or purchase a westbound fare at fare payment machines at LaGuardia Airport stops. The M23 route has been traditionally crowded, with 4,862,343 riders in 2010 and 3,831,755 riders in 2015, or 15,000 riders a day. In 2003, it was given the "Pokey Award" by the Straphangers Campaign, the least prestigious award given to other New York City Bus routes that also runs at a speed of 4 mph; it also got that distinction in 2007 when it also ran at an average of 4 miles per hour (6.4 km/h), slightly faster than the average walking speed of 3 miles per hour (4.8 km/h). In 2009, the MTA and the New York City Department of Transportation (NYCDOT) identified the M14A/D, on parallel 14th Street, as a potential corridor for Phase II of SBS, the city's bus rapid transit system, as well as finalized plans to implement SBS on the M16/M34 along the also-parallel 34th Street. The crosstown bus corridors were noted for slow travel speeds. The M23 was originally not planned to be an SBS route, but in 2008, it had been part of a pilot program in which 30 articulated, redesigned SBS buses were rolled out on the M23 for some time. After lengthy consultation, the M23 was converted to SBS on November 6, 2016, replacing the identical local counterpart bus line. Unlike the former local line, the westbound stop on 5th Avenue and two bi-directional stops on Lexington Avenue are not served by this line. The M23 is based out of the Michael J. Quill Bus Depot. The M23 is the fifth corridor in Manhattan and the sixth Manhattan bus line to have Select Bus Service. A westbound M79 SBS at 81st Street and Central Park West. The M79 local bus route was identified as a heavily traveled corridor in a 2009 study by the DOT and NYCTA, and in a December 2013 study by the Pratt Center for Community Development of Brooklyn. It was converted to SBS on May 21, 2017. Bidirectional Note: riders boarding at the Central Park Transverse stop will need to obtain their proof of fare payment receipt at the next stop (Central Park West or Fifth Ave depending on direction of travel). The Bx6, a critical Bronx crosstown corridor, was split off into 2 different routes from the original Bx6 local on September 3, 2017. The Bx6 local continues to make all local stops along the route. The Bx6 SBS will operate a similar route as the local, but the eastbound service matches the westbound service instead of exiting the Macombs Dam Bridge to Jerome Avenue. The Bx6 SBS supplements the existing Bx6 local service, making stops at select high-ridership locations and all transfers points to Metro-North and subways. The Bx6 SBS is based out of the West Farms Bus Depot, as is the Bx6 local. It is also the third Bronx Bus line to have Select Bus Service and the first one since the Bx41 on June 30, 2013. The Bx6 is also the MTA's 15th Select Bus Service line to date. The Bx6 corridor is the first to use bus lanes in the median of the street at the E 161st Street/Sheridan-Sherman Avenues stops, as opposed to curbside or offset bus lanes. The median bus lanes supposedly speeds up traffic by going around double-parked cars. Originally, a similar provision of median bus lanes was planned for the 34th Street Corridor in Manhattan. A planned "Busway" would have seen both the M34 and M34A SBS lines run along 34th Street in a special two-lane corridor with vehicular traffic travelling in only one direction (westbound after 6th Avenue/Broadway; eastbound after 5th Avenue), this was eventually scrapped and replaced with curbside and offset bus lanes along 34th Street with bus bulbs at selected bus stops (see above). The Q52 and Q53 buses were converted to Select Bus Lines on November 12, 2017. The Q52 SBS is based out of the JFK Depot, while the Q53 SBS is based out of the LaGuardia Depot. They are also the 3rd and 4th Queens bus lines to be converted into Select Bus Service (the 2nd and 3rd bus lines of MTA Bus). The B82 Limited was converted to Select Bus Service on October 1, 2018. The B82 SBS however did not replace limited service between Bay 37th St and Coney Island. The B82 is the 3rd Brooklyn bus line (the MTA's 18th) to have Select Bus Service, and the only SBS line to run on weekdays only. Service on late nights and weekends will be provided by the B82 local. Other Select Bus Service routes are planned for the near future as part of the continuation of Phase II, including neighborhoods underserved by rapid transit and heavily used express bus routes. These were identified during a 2009 study by the DOT and MTA, in a December 2013 study by the Pratt Center for Community Development of Brooklyn, and in a 2017 by the DOT and MTA. Twenty-one routes are expected to be added to the SBS system between October 2017 and 2027. A new SBS route along 14th Street in Manhattan was planned for implementation in January 2019 in anticipation of the closure of the 14th Street Tunnel, in addition to the existing M14A or M14D routes. This new SBS route would have initially run between the West Side at 10th Avenue and 14th Street and the First Avenue station on the Lower East Side, and would have been extended north to a ferry landing at Stuyvesant Cove Park in April 2019. Four temporary SBS routes from Manhattan to Brooklyn via the Williamsburg Bridge, labeled L1 through L4, would have also been created. Some form of M14 SBS service would have remained in operation once construction was complete. However, following the alteration in the 14th Street Tunnel rehabilitation plans in January 2019, the L1 through L4 SBS routes were canceled and the M14 SBS was put on hold. New York City Transit still plans to have SBS along the corridor, and is working with the DOT on the plan. The preliminary plan is to convert both the M14A and M14D routes into SBS routes. The M96 was set to become the next route to be converted to Select Bus Service after the M14, with implementation set for 2019, but was pushed back due to budget constraints. Bus lanes will be added to 96th Street, bus stops will be consolidated and signal timing will be changed along the street as part of the Better Buses Action Plan, which was unveiled on April 19, 2019, making it one of the next corridors to become SBS. The Q25 or Q34 Limited, running primarily along Parsons and Kissena Boulevards in Queens, has been proposed for conversion to Select Bus Service. The corridor was one of the possible future corridors identified in the 2017 announcement about the SBS system's expansion. Other potential routes such as the B41 have undergone preliminary studies and community outreach, but have yet to be considered for implementation. Below are potential corridors and neighborhoods listed under the 2009 study, current Phase II plans that have not already been implemented, and from the 2017 study. Multiple Southern Brooklyn East-West Corridors (current B6 and B82): B82 implemented on October 1, 2018. 14th Street Crosstown Corridor – 23rd Street/11th Avenue to Grand Street/Avenue D (current M14A/M14D); planned for implementation. Jamaica to Flushing Corridor: Q25 Limited is proposed for future conversion. Northern Boulevard Flushing – Manhattan Corridor via Queensboro Bridge: Q66 is proposed for future conversion. South Bronx: Bx6 SBS was implemented on September 3, 2017. There are also "tiered" corridors based on importance, identified in the Pratt Center report in December 2013 and a previous report from 2007. LaGuardia–Woodhaven/Cross Bay–Rockaway (Queens); Combination of current Q72 and Q52/Q53 routes. Q52/Q53 LTD (Woodhaven & Cross Bay Boulevards) converted on November 12, 2017. Industry City/Sunset Park–Linden–JFK (Brooklyn–Queens); B35 route and eastern portion of the B15 route. SBS shelter (left) and fare inspection aboard a SBS bus (right). The fare for SBS is the same as on all New York City Transit local and limited-stop buses, $2.75, payable with a MetroCard or coins at booths on each stop. Boarding procedures for the S79 SBS are the same as those on regular local and limited-stop buses. On all other SBS services, unlike other bus lines in New York City, fare collection for SBS uses a proof-of-payment system. Passengers are required to pay their fare before boarding the bus at pay stations located in bus shelters at the designated stops (for customers using UniTicket, which is valid for boarding). Once fare payment is made, one must board the bus at that stop within one hour. Boarding can be done via any of the two or three doors (depending on the bus fleet), except on S79 buses, where all passengers board from the front door since fares are paid on board. New York City Transit fare inspectors (organized in "EAGLE" teams), NYPD officers, or MTA police officers check for proof of payment receipts; those unable to produce one are subject to a fine of up to $100. These inspections are conducted randomly, or through the entire bus at specific stations. In addition, proof-of-payment receipts are only valid for the route that stops at the station at which one boards (i.e., an M34/M34A SBS receipt cannot be used on the M15 SBS). When transferring from one SBS route to another, one must obtain a second receipt from that route's fare payment machines. Free transfers between routes are also provided with MetroCards. Select Bus Service fare machines consist of modified versions of existing MTA and DOT devices. MetroCard payment utilizes MetroCard Fare Collection Machines, similar in design to ATM/Debit Card MetroCard vending machines (known as MetroCard Express Machines) used in the New York City Subway, but without touch screens. Coin payment utilizes a modified Parkeon Muni Meter. The original machines used on the Bx12 in 2008 consisted of re-purposed versions of MetroCard Express Machines and first-generation Parkeon multi-space devices, which have since been replaced. Select Bus Service buses are wrapped in a unique blue paint scheme that identifies them as operating in this particular service. Older buses are painted mostly white, with a blue stripe just below the windows and a teal pattern with plus signs and "+selectbusservice" logos. In March 2016, a new gold-and-blue livery was introduced across the entire MTA fleet. SBS buses delivered after March 2016 have a variation of this livery, with the teal pattern below the windows and the new gold and blue livery above. On the buses with 2016 livery, the Select Bus Service logo is located at the front and sides the bus. Q70 buses contain a unique "LaGuardia Link" livery with clouds and airplane outlines against a turquoise background on the top, as well as the words "LaGuardia Link", the route bullets for the 7​, E, ​F, ​M, and ​R trains, and the Long Island Rail Road (LIRR) acronym. The bottom of LaGuardia Link buses contain a wave pattern in various shades of teal and blue, with plus signs and the SBS logo on the front of the bus. From left to right: 2008–2016 livery, post-2016 livery, and Q70 LaGuardia Link livery. The former blue flashing lights as seen on an M15 (top), which were taken down in 2013, and the new blue destination sign as seen on an M86 (bottom) that replaced the lights. All SBS buses display +Select Bus in the destination sign. Bus stops where SBS buses stop are also identifiable with the SBS branding on the glass shelters, and machines for MetroCard and coin payment in or near the shelters (except for the S79 SBS, which does not employ off-board fare collection). In addition, all buses on the SBS services employ all-door boarding operation, in which each set of doors open simultaneously for easier boarding and alighting, with the exception of the S79 which does not employ all-door boarding. Upon the debut of Select Bus Service, blue flashing lights on both sides of the destination sign were used to help designate SBS buses from local buses (which have orange lights). While some, including bus operators, claimed the flashing blue lights helped improve travel times for buses, they were controversial due to some drivers mistaking them for emergency vehicles. The use of the lights also violated the New York State Vehicle and Traffic Law (Article 9, Section 375 (41)). NYS Law states "The use of blue lights on vehicles shall be restricted for use only by a volunteer firefighter" and "may be affixed to a police vehicle and fire vehicle, provided that such blue light or lights shall be displayed on a police vehicle and fire vehicle for rear projection only." The lights were removed from service on January 18, 2013. To replace the lights, in July 2015 the MTA began overhauling the front destination signs of buses to display the route in a blue background, as well as a completely blue background that flashes twice when it says +Select Bus (formerly it read +Select Bus Service). At night on some routes, the front destination sign is blue text on an unlit black background. Starting with the Q44 in November 2015, the blue background is kept when the front signage transitions to show the terminal of the route and the main streets traveled. As of July 2017, the SBS fleet on all routes have had their front destination signs overhauled, and new routes that launched after December 2015 came with the new destination signs. ^ "Bus Rapid Transit For New York City" (PDF). Schaller Consulting, Transportation Alternatives, New York Public Interest Research Group. June 2002. Retrieved December 24, 2015. ^ a b "First Avenue/Second Avenue SBS Community Advisory Committee Meeting" (PDF). nyc.gov. Metropolitan Transportation Authority, New York City Department of Transportation. September 23, 2009. Retrieved March 7, 2016. ^ "Bus Rapid Transit: NYCBRT Study" (PDF). Metropolitan Transportation Authority, New York City Department of Transportation, New York State Department of Transportation. 2004. Archived from the original (PDF) on May 12, 2005. Retrieved February 15, 2016. ^ a b "Select Bus Service on the Bx12: A BRT Partnership Between the New York City DOT and MTA New York City Transit" (PDF). Metropolitan Transportation Authority, New York City Department of Transportation. January 12, 2009. Retrieved March 4, 2016. ^ a b Aaron, Brad (April 17, 2008). "A Transit Miracle on 34th Street". Retrieved July 1, 2008. ^ "Bus Rapid Transit: NYCBRT Study; ITS-NY Conference" (PDF). Metropolitan Transportation Authority, New York City Department of Transportation, New York State Department of Transportation. June 8, 2007. Retrieved April 10, 2016. 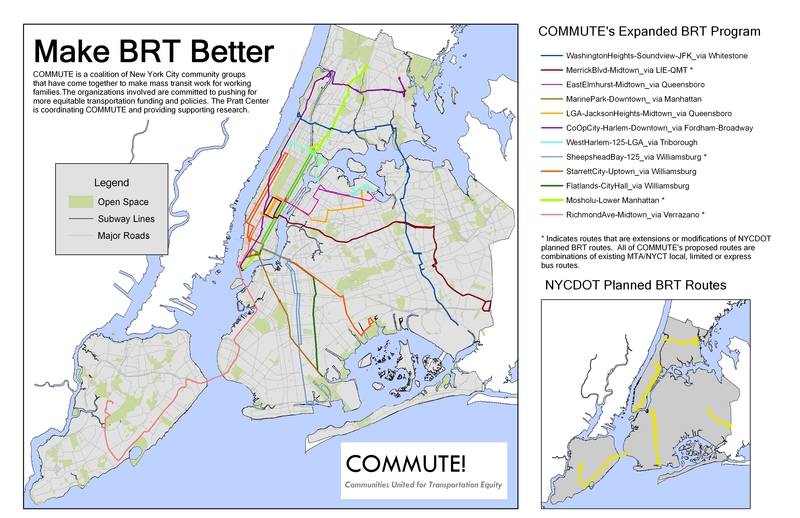 ^ "Map of BRT ideas in New York City". Retrieved July 1, 2008. ^ a b c "MTA Planning – NYC Select Bus Service". Retrieved July 1, 2008. ^ a b Higashide, Steven (July 15, 2009). "Staten Island Pols Not Walking the Transit Talk". Retrieved October 19, 2007. ^ Weickgenant, Joel (April 12, 2007). "Merrick Parking In Doubt As Rapid Transit Nears". Queens Chronicle. Retrieved July 1, 2008. ^ Staten Island Advance. "Staten Island pols seek meeting to discuss Bus Rapid Transit on Hylan Boulevard". SILive.com. Retrieved April 28, 2014. ^ a b c d e f g h i j k l m n o p q r s t u v w x "2017 Bus Forward" (PDF). nyc.gov. New York City Department of Transportation. October 20, 2017. Retrieved October 20, 2017. ^ "NYC's First – And Only? – Bus Rapid Transit Route". March 25, 2008. Retrieved July 1, 2008. ^ "Mayor Bloomberg, MTA Executive Director and CEO Sander, and DOT Commissioner Sadik-Khan Unveil New MTA Select Bus Service (SBS) System". March 25, 2008. Retrieved February 18, 2018. ^ Lew, Alexander (June 30, 2008). "Bus Rapid Transit Debuts in the Bronx". Wired.com blog network. Retrieved July 1, 2008. ^ "MTA Bus Company Committee Meeting Materials, July 2010" (PDF). p. 76. Retrieved August 13, 2010. ^ "Select Bus Service – First Avenue/Second Avenue" (PDF). New York City Department of Transportation. Retrieved April 4, 2010. ^ "34th Street: The life and death of a Great Idea". Second Ave. Sagas. March 3, 2011. Retrieved September 25, 2016. ^ "S79 SELECT BUS SERVICE BEGINS SEPTEMBER 2, 2012" (PDF). nyc.gov. New York City Department of Transportation. August 2012. Retrieved September 25, 2016. ^ "mta.info | 2014–2017 MTA Financial Plan" (PDF). Web.mta.info. Retrieved April 28, 2014. ^ a b "M86 Crosstown Line to Get Select Bus Service". DNAinfo New York. Archived from the original on January 22, 2015. ^ a b "Utica Avenue Select Bus Service". NYC.gov. ^ "Main Street Select Bus Service". NYC.gov. Miranda Katz. "Cuomo Drops Slick New LaGuardia Renderings & Hopeful Select Bus News". Gothamist. Archived from the original on June 18, 2016. Retrieved June 16, 2016. "Governor Cuomo, Joined by Vice President Joe Biden, Announces Groundbreaking on New LaGuardia Airport". Governor Andrew M. Cuomo. June 14, 2016. Retrieved June 16, 2016. "Transit & Bus Committee Meeting June 2016" (PDF). www.mta.info. Metropolitan Transportation Authority. June 17, 2016. Archived from the original (PDF) on August 7, 2016. Retrieved June 17, 2016. "Effective November 6, 2016 M23 Select Bus Service". web.mta.info. Metropolitan Transportation Authority. October 2016. Retrieved October 31, 2016. "Select Bus Service Coming to 'City's Slowest' M79 Bus Next Year: Officials". DNAinfo New York. Archived from the original on October 11, 2016. Retrieved October 10, 2016. "M86 and M79 Select Bus Service Manhattan Community Board 8 | October 5, 2016". Scribd. New York City Department of Transportation. October 5, 2016. Retrieved October 10, 2016. ^ a b "Newsletter 2 / Spring 2017 161st Street Design Proposal for Bx6 SBS" (PDF). nyc.gov. April 2017. Retrieved April 28, 2017. ^ a b "Woodhaven-Cross Bay Boulevards Select Bus Service". nyc.gov. New York City Department of Transportation. April 23, 2014. Retrieved April 28, 2014. ^ "Woodhaven/Cross Bay Boulevard (Q52/53) Presentation to Community Board 14 January 10, 2017" (PDF). nyc.gov. New York City Department of Transportation. January 10, 2017. Retrieved April 29, 2017. ^ a b "For presentation to CB 15 Transportation Committee | March 13, 2018" (PDF). nyc.gov. New York City Department of Transportation. March 13, 2018. Retrieved April 9, 2018. ^ Berger, Paul (August 14, 2018). "Subway, Bus Cuts Loom as MTA Faces Financial Crisis". Wall Street Journal. Retrieved August 22, 2018. ^ a b Pereira, Sydney (January 4, 2019). "Gov. Cuomo scraps 15-month full L train shutdown plan". The Villager (Manhattan). Retrieved January 14, 2019. ^ Berger, Paul (January 3, 2019). "Cuomo Cancels Full L-Train Shutdown in New York City". Wall Street Journal. Retrieved January 4, 2019. ^ Fitzsimmons, Emma G.; Goldmacher, Shane (January 3, 2019). "Full Shutdown of L Train to Be Halted by Cuomo". The New York Times. ISSN 0362-4331. Retrieved January 3, 2019. ^ Siff, Andrew (January 3, 2019). "'No L-pocalypse': New Plan Avoids Dreaded Subway Shutdown". NBC New York. Retrieved January 4, 2019. ^ a b "L Project Weekly #10: This week's news, that Court Sq moving walkway, Select Bus Service coming to 14th Street". us18.campaign-archive.com. Metropolitan Transportation Authority. February 16, 2019. Retrieved February 16, 2019. ^ "M14A/D Select Bus Service Elected Officials Briefing March 6, 2019". New York City Department of Transportation. March 6, 2019. Retrieved April 19, 2019. ^ "Select Bus Service Package of improvements working together to keep buses moving" (PDF). new.mta.info. Metropolitan Transportation Authority. April 2, 2019. Retrieved April 19, 2019. ^ "Bx12 Select Bus Service schedule" (PDF). mta.info. June 23, 2008. Retrieved July 1, 2008. ^ Rocchio, Patrick (January 16, 2009). "MTA restores Sedgwick Ave. bus stop – CB 7's efforts add Bx12 route change". Bronx Times. Archived from the original on July 21, 2011. Retrieved January 24, 2009. ^ "Bx12 Select Bus Service schedule" (PDF). Metropolitan Transportation Authority. March 20, 2009. Retrieved April 13, 2009. ^ "Introducing 34 St Select Bus Service". MTA.info (YouTube). November 14, 2011. Retrieved November 15, 2011. ^ "34th Street Select Bus Service Newsletter 1/July 2011" (PDF). July 2011. Retrieved July 28, 2011. ^ "Select Bus Service Arrives at 34th Street". MTA.info. November 14, 2011. Retrieved November 20, 2011. ^ "M34/M34A Select Bus Service Schedule" (PDF). mta.info. Metropolitan Transportation Authority. September 3, 2017. Archived (PDF) from the original on September 16, 2017. Retrieved October 22, 2017. ^ "MTA Bus Operations Committee Meeting July 2012" (PDF). Metropolitan Transportation Authority. July 2012. Retrieved March 9, 2016. ^ "Hylan Boulevard Transportation Improvement Study" (PDF). Metropolitan Transportation Authority, New York City Department of Transportation. July 2012. Retrieved September 26, 2016. ^ a b "S79 on Hylan Boulevard +selectbusservice Progress Report" (PDF). Metropolitan Transportation Authority. 2013. Retrieved September 26, 2016. ^ "MTA Bus Operations Committee Meeting – May 2012" (PDF). May 2011. Retrieved May 21, 2012. ^ a b c "+selectbusservice: Bx41 on Webster Avenue Progress Report" (PDF). nyc.gov. Metropolitan Transportation Authority, New York City Department of Transportation. August 25, 2014. Retrieved December 24, 2015. ^ a b c d "Transit & Bus Committee Meeting April 2013" (PDF). Metropolitan Transportation Authority. April 2013. Archived from the original (PDF) on October 4, 2013. Retrieved December 24, 2015. ^ "Webster Avenue SBS" (PDF). nyc.gov. Metropolitan Transportation Authority, New York City Department of Transportation. January 8, 2013. Retrieved December 24, 2015. ^ "Transit & Bus Committee Meeting: July 2013" (PDF). Metropolitan Transportation Authority. July 2013. Archived from the original (PDF) on October 4, 2013. ^ "+selectbusservice Nostrand Avenue/Rogers Avenue Newsletter 1/Summer 2011" (PDF). Summer 2011. Retrieved July 28, 2011. ^ "Commuters want B44 stops restored to new Select Bus Service route – News 12 Brooklyn". Brooklyn.news12.com. November 19, 2013. Retrieved April 28, 2014. ^ "Assemblywoman Jacobs Urges the MTA to Consider Community Input About the B44 Bus" (Press release). Assemblywoman Rhoda S. Jacobs. n.d. Retrieved April 28, 2014 – via Mailjet. ^ "MTA Select Bus Service | B44 Nostrand Avenue". Web.mta.info. November 17, 2013. Retrieved April 28, 2014. ^ Kabak, Benjamin (February 24, 2014). "Thoughts on missed opportunities as SBS M60 nears". Second Avenue Sagas. Retrieved April 21, 2014. ^ Miller, Stephen (October 11, 2013). "The Abbreviated Plan for 125th Street Select Bus Service Is Back". Streetsblog NYC. Retrieved April 21, 2014. ^ a b "Transit & Bus Committee Meeting February 2014" (PDF). Metropolitan Transportation Authority. February 2014. Archived from the original (PDF) on February 24, 2014. Retrieved February 23, 2014. ^ Solmonow, Seth. "NYC DOT, MTA and State Sen. Perkins Announce 125th St. Select Bus Service to Start in April 2014, Streetscape Improvements to be Installed Along the Entire Corridor". nyc.gov. New York City Department of Transportation. Retrieved October 12, 2013. ^ "Select Bus Service on the M60". web.mta.info. Metropolitan Transportation Authority. Retrieved September 26, 2016. ^ "Going to an Airport? Get Connected with Metro-North" (PDF). Metropolitan Transportation Authority. August 2014. Retrieved December 26, 2015. M60 SBS buses are equipped with luggage racks. ^ "86th Street Select Bus Service". nyc.gov. ^ "NYC Department of Transportation, NYC Transit and Elected Officials Announce Launch of Select Bus Service on 86th Street". mta.info. ^ "M86 86th Street Manhattan Crosstown". mta.info. ^ a b "Flushing To Jamaica Select Bus Service: January 22, 2015: Public Open House" (PDF). nyc.gov. Metropolitan Transportation Authority, New York City Department of Transportation. January 22, 2015. Retrieved July 6, 2015. ^ a b "Q44 Select Bus Service: Queens Community Board 12 Transportation Committee" (PDF). New York City Department of Transportation. June 9, 2015. Retrieved October 16, 2015. ^ Toure, Madina (January 22, 2015). "NE Queens leaders wary of Select Bus Service proposal". timesledger.com. Times Ledger. Retrieved July 6, 2015. ^ a b Cronin, Jon (June 4, 2015). "DOT Presents Updated SBS Plan For Main St". queenstribune.com. Queen Tribune. Retrieved July 6, 2015. ^ Kern-Jedrychowska, Ewa (November 30, 2015). "Q44 Select Bus Service Rolls Out to Ease Commute Between Queens and Bronx". Queens: DNAinfo.com. Archived from the original on December 2, 2015. Retrieved December 3, 2015. ^ Offner, Daniel (April 23, 2015). "No Bus-Only Lane For Part of Main Street". queenstribune.com. Queens Tribune. Retrieved July 6, 2015. ^ "Jamaica Bus Improvement Study: Community Advisory Committee Meeting #2" (PDF). New York City Department of Transportation. March 25, 2011. Retrieved April 10, 2016. ^ "Bus Rapid Transit – Flushing To Jamaica". nyc.gov. November 29, 2015. Retrieved November 29, 2015. ^ a b c d e f g h "Select Bus Service" (PDF). New York City Department of Transportation, MTA New York City Transit Authority. November 2013. Retrieved December 13, 2015. ^ Newman, Phillip (September 16, 2013). "Take 15-minute ride to LaGuardia Airport on Q70". TimesLedger. Retrieved December 13, 2015. ^ "Q70: Limited-Stop Service to LaGuardia Airport". Metropolitan Transportation Authority. Retrieved December 13, 2015. ^ "Transit & Bus Committee Meeting December 2015" (PDF). Metropolitan Transportation Authority. December 2015. Retrieved January 8, 2016. ^ Press Release (January 22, 2016). "MTA Bus Adds Service to Popular Q70 Route to La Guardia Airport: Fast and Reliable Bus Connection Will Operate Every 8-10 Minutes". Metropolitan Transportation Authority. Retrieved March 9, 2016. ^ a b Chan, Sewell (August 9, 2016). "And the Award for Slowest City Bus Goes to ..." City Room. Retrieved September 22, 2016. ^ "Straphangers Campaign". NYPIRG Straphangers Campaign. November 12, 2003. Archived from the original on March 5, 2017. Retrieved September 22, 2016. ^ "NYPIRG Straphangers' Campaign Payphone Report: 2007". NYPIRG Straphangers Campaign. Archived from the original on January 6, 2017. Retrieved September 22, 2016. ^ a b c d e f g "Introduction to BUS RAPID TRANSIT PHASE II" (PDF). New York City Department of Transportation, Metropolitan Transportation Authority. 2009. ^ Mascia, Jennifer (May 15, 2008). "It's No Hallucination: Polka-Dot Buses Aim to Cut Travel Time". The New York Times. Retrieved September 22, 2016. ^ "Bx6 Becomes MTA's 15th Select Bus Service Route". mta.info. ^ Martinez, Jose (October 5, 2017). "Bronx SBS ride is the first to travel through center of streets". NY1. Charter Communications. Retrieved October 8, 2017. ^ "BUS RAPID TRANSIT PHASE II: Future Corridors" (PDF). New York City Department of Transportation, Metropolitan Transportation Authority. June 2010. Retrieved January 1, 2016. ^ Warerkar, Tanay (October 20, 2017). "NYC Select Bus Service will come to 21 new routes in the next decade". Curbed NY. Retrieved October 24, 2017. ^ "21 new SBS routes coming over next 10 years: Mayor". Metro US. October 20, 2017. Retrieved October 24, 2017. ^ "MTA, DOT to Launch M14 SBS Ahead of L Train Tunnel Reconstruction Project". mta.info. Metropolitan Transportation Authority. July 23, 2018. Retrieved October 18, 2018. ^ "Gale A. Brewer, Manhattan Borough President Testimony on Proposed MTA Fare Increases" (PDF). manhattanbp.nyc.gov. Office of the President Borough of Manhattan. November 27, 2018. Retrieved April 19, 2019. ^ "Better Buses Action Plan" (PDF). nyc.gov. New York City Department of Transportation. April 18, 2019. Retrieved April 19, 2019. ^ a b c d e "Northeast Queens Bus Study" (PDF). Metropolitan Transportation Authority. September 2015. Retrieved December 11, 2015. ^ a b c "Metropolitan Transportation Authority July Financial Plan 2017 – 2020 Presentation to the Board July 27, 2016" (PDF). mta.info. Metropolitan Transportation Authority. July 27, 2016. p. 8. Retrieved October 20, 2017. ^ Barca, Christopher (October 26, 2017). "City plans more SBS routes for Queens". Queens Chronicle. Retrieved April 19, 2018. ^ a b "South Bronx Crosstown". nyc.gov. +selectbusservice. Retrieved December 16, 2015. ^ a b Harshbarger, Rebecca (December 29, 2015). "NYC transit 2016: Where subway Wi-Fi is coming, new Citi Bike stations". AM New York. ^ a b "Make BRT Better" (PDF). Pratt Center for Community Development, COMMUTE. Archived from the original (PDF) on May 17, 2013. Retrieved December 13, 2015. ^ a b c d e f g h "NYSDOT Statewide Transportation Improvement Program (STIP)". dot.ny.gov. New York State Department of Transportation. January 4, 2017. Retrieved January 16, 2017. ^ a b "South Brooklyn Select Bus Service". nyc.gov. Select Bus Service. Retrieved December 16, 2015. ^ "B82 Select Bus Service For presentation to CB 5 Transportation Committee | April 24, 2017" (PDF). nyc.gov. April 24, 2017. Retrieved April 28, 2017. ^ "New bus lanes are now installed along Pennsylvania Ave in Brooklyn from Flatlands Ave to Seaview Ave, serving Starrett City/Spring Creek Towers. Select Bus Service starts 10/1". New York City Department of Transportation. Retrieved August 21, 2018. ^ "MTA proposes bus from Bushwick to Downtown BK". News 12 Brooklyn. Retrieved October 11, 2016. ^ "Express yourself! MTA wants select bus between Bushwick and Downtown". Brooklyn Paper. Retrieved October 11, 2016. ^ a b "NYCT NORTH SHORE ALTERNATIVES ANALYSIS: Alternatives Analysis Report" (PDF). mta.info. Metropolitan Transportation Authority. August 2012. Retrieved July 20, 2015. ^ Neuman, William (June 29, 2008). "Riders Will Pay Before Boarding, and Save Time, on Revamped Bus Route". The New York Times. Retrieved July 1, 2008. ^ "2013 Apta Draft Final Color" (PDF). American Public Transportation Association. 2013. Retrieved January 20, 2016. ^ a b "Bx12 Select Bus Service One Year Report" (PDF). Metropolitan Transportation Authority. October 2009. Retrieved January 8, 2016. ^ "A Bronx Tale: Bus Rapid Transit in New York City". Metropolitan Transportation Authority, New York City Department of Transportation. Retrieved January 8, 2016. ^ "Select Bus Service Vending Machine Graphics and Interface Redesign" (PDF). 34th Street Partnership. 2012. Retrieved January 8, 2016. ^ "2,042 New Buses to Have Free Wi-Fi and USB Charging Ports by 2020". Metropolitan Transportation Authority. March 8, 2016. Retrieved March 9, 2016. ^ a b Rubinstein, Dana (March 15, 2013). "The M.T.A. dims flashing blue lights, and Select Bus Service stops making so much sense". capitalnewyork.com. Politico. Retrieved September 2, 2015. ^ Donohue, Pete (October 18, 2010). "Bright blue beacons on express bus lines may violate state law". New York Daily News. Retrieved November 16, 2010. ^ "NYS GTSC – Vehicle & Traffic Law – Section 375 (41)". Retrieved November 20, 2010. ^ Mocker, Greg (July 8, 2015). "Some NYC buses get a new look". PIX 11. Retrieved September 2, 2015. ^ NY1 News (June 28, 2015). "MTA Debuts New Select Bus Service Signs". NY1. Retrieved September 2, 2015. Wikimedia Commons has media related to Select Bus Service. This page was last edited on 19 April 2019, at 22:40 (UTC).